An Engagement Ring Story Like No Other! Colleen and “J.” live on top of the world or about as close to it as you can possibly get. Their home is located in the Canadian Arctic (Iqaluit in theCanadian territory of Nunavut). Average monthly temperatures in Iqaluit are below freezing for eight months of the year and just over 50 degrees Fahrenheit in the short “summer” months. 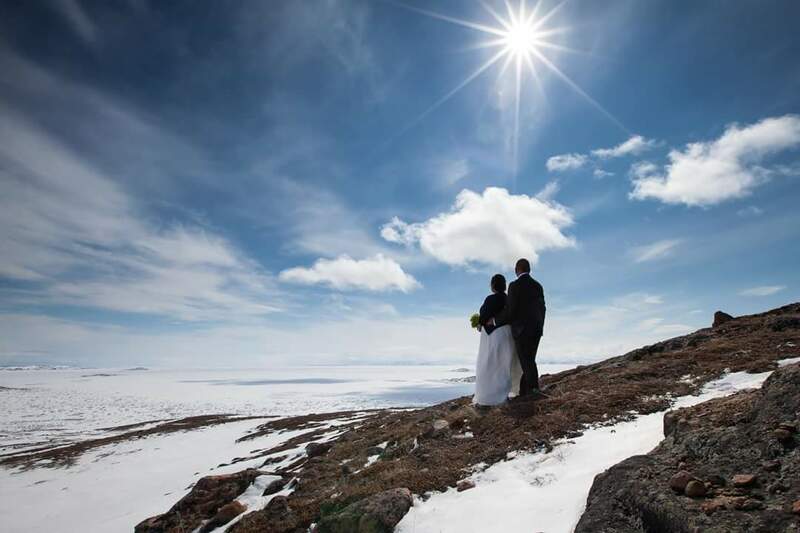 Iqaluit is an arctic paradise that Colleen describes as an incredible and never-ending landscape with captivating tundra and coastlines and no trees (as they are above the tree-line). “It’s hard to imagine a more beautiful place to live on earth”, says Colleen. Colleen, an Iqaluit native, works for the Canadian Government and has a small side business as an Art Conservator. She also writes a really fabulous ArcticDECO blog with tons of great home decorating, renovation, and organizational tips with a focus on her favorite design inspiration, the Art Deco period. 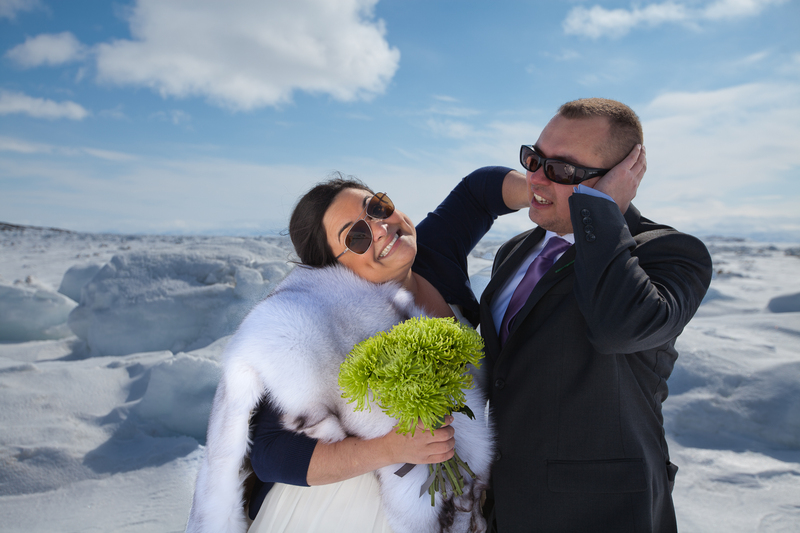 Colleen’s husband, “J”, originally from Resolute Bay, the second most northernly community in North America (close to the North Pole), settled in Iqaluit after his University education. Colleen and “J” met at a mutual friend’s gathering/games night and fell in love. Colleen and “J” enjoy many things about living in the remote Canadian Arctic, the landscape and the amazing, talented, and resilient people, but there are also some challenges associated with living above the 60th parallel north. Simple things that most of us take for granted, like easy access to mail, food, and essentials, are not all that straightforward in Iqaluit. There are no roads in or out of the city, so supplies are flown or shipped in during the short summer season. This, in turn, translates into an extremely high cost of living and limited access to goods. There are only 3 small stores in town and a container of orange juice typically costs $22 or more. Because Iqaluit is so physically isolated from other areas, on-line shopping is a must for many items (including engagement rings). When Colleen and “J” decided to marry, they turned to their computers in search of her perfect ring. 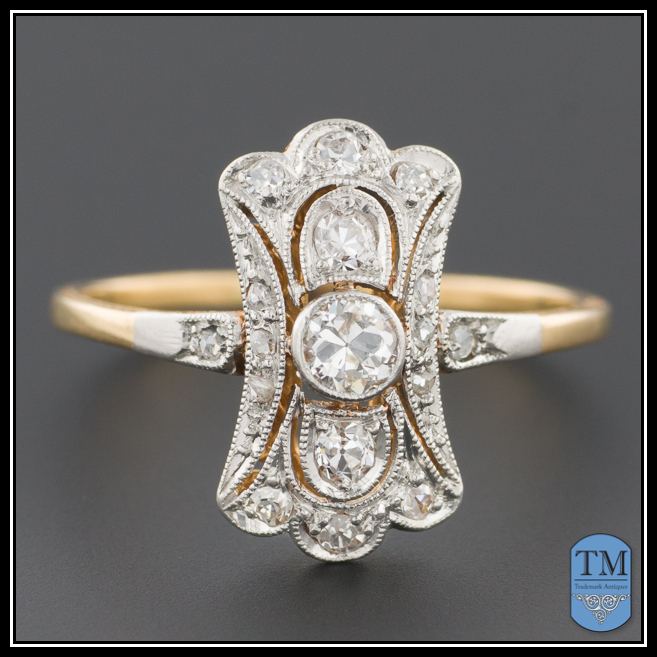 Since Colleen is an art conservator with a love of history and Art Deco design she was looking for an Art Deco panel-style engagement ring that was neither too big, nor too simplistic. Amazingly, she found exactly the type of ring she was seeking on our Etsy store — a delicately crafted Edwardian platinum topped 18k gold ring with a complex open work design accented with tiny bead set diamonds. The process of selecting a ring was only the first step on Colleen’s quest to actually receiving her dream engagement ring. She then needed to concern herself with the considerable task of getting the ring safely through its journey of some 2590 kilometers to her remote home. With winter fast approaching, Colleen’s ring set off on its adventure by FedEx from Lewisburg, PA to Iqaluit in early October. It should be mentioned that Iqaluit isn’t connected to other settlements by a highway, so inbound mail shipments are only possible by aircraft and, ice conditions permitting, by boat. She expected it to take several weeks to arrive, and so she waited patiently . Because of the remote nature of Iqaluit, Fedex relies on a network of third party carriers to route parcels to their final destinations. Unfortunately, FedEx loses the ability to track the whereabouts of packages as soon as they are handed over to these third party couriers. Unbeknownst to either Colleen or ourselves, the ring arrived in her town just 7 days after being shipped. Then came the waiting game. And, so we all waited, and waited, and waited… Week after week passed and Colleen and I repeatedly called FedEx and the moving company that was contracted to deliver her package, but had no luck getting information on its whereabouts. To all of our disappointment, FedEx officially declared Colleen’s engagement ring parcel missing in mid-November. I completely lost hope by this point, but not Colleen! Utterly undeterred by FedEx’s declaration, Colleen was unwilling to accept that her package was lost somewhere in her own town. After buckets of tears and countless emails and calls, Colleen charged down to the local moving company’s warehouse and insisted to search through all of their packages. To everyone’s surprise except maybe her own, Colleen found her FedEx package hiding in a corner under a pile of other “undeliverable” items. The moral…never underestimate a woman in love. Ring finally in hand, Colleen and “J” were married just a few weeks ago in front of their close family and friends. 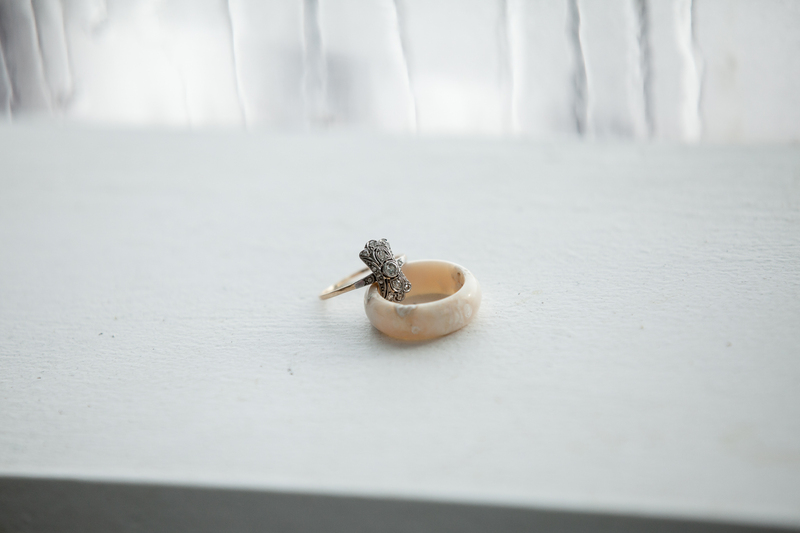 Colleen used this very special ring during the ceremony because she is still hunting for the perfect Deco-esque band that will match. “J’s” band (shown in the photo) was custom made by Dan Wade out of walrus tusk ivory, which is often used by Inuit for jewelry and carvings (Dan Wade’s Website: www.danwade.ca). Colleen and “J” are building their life in her family home that her father built in the early 1980’s. They purchased the home from her parents when they retired to southern Canada a couple of years ago. They are breathing new life into the home with some very creative renovation projects that she shares on her ArcticDECO blog http://www.arcticdeco.com. 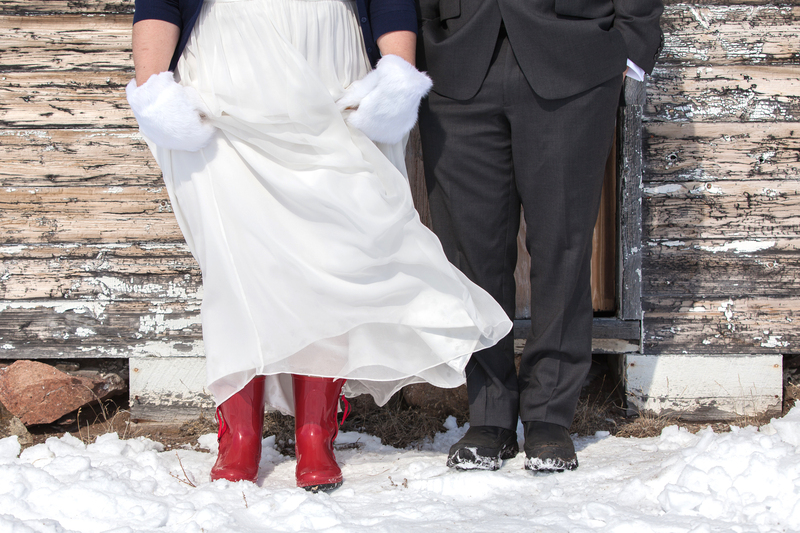 Look at Those Red Boots!!! 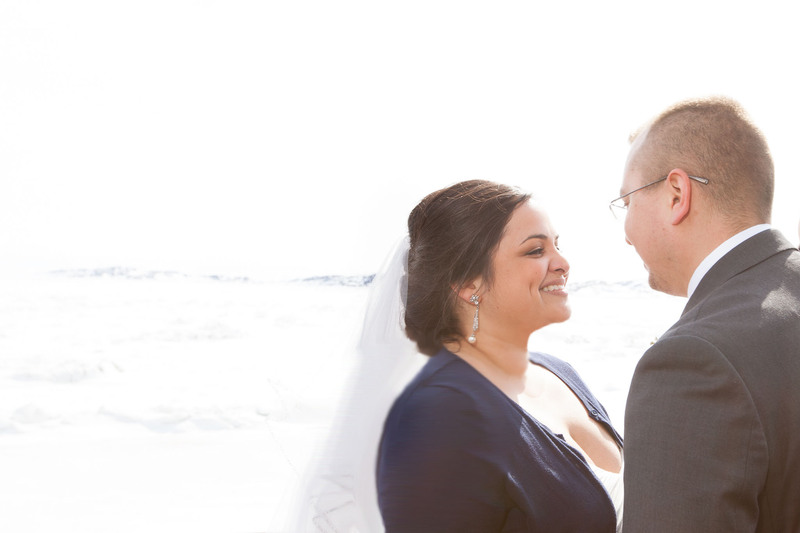 My husband and I were so thrilled to share this wedding ring journey with Colleen and “J.”, and we wish them a mountain of happiness as they begin their married life together!